Summer is the perfect time to try new grill recipes and cook outdoors. Spend your evenings well outdoors with friends and family, playing a game of corn hole or bocce ball. Grill food while relaxing outside! Enjoy sweet summertime! If you don’t own a grill, now would be a great time to invest in one! It’s too hot to heat up your house with the oven anyways! Invest in a grill with a side burner, like many have these days, and you can cook vegetables and sauces on the side. Some of our favorite recipes include summer chicken burgers, skewers of steak, peppers, and onions, or shrimp with pesto, or honey teriyaki chicken. I can’t wait to try grilled watermelon or peaches. 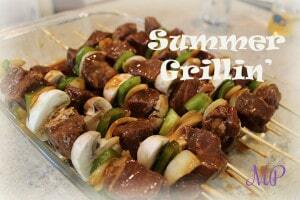 What are you craving this summer from the grill?